If you are searching for Dorset activities, join those in the know who have been learning to windsurf in some of the best learning conditions in the UK for years. Poole Harbour is the second largest natural harbour in the world & has the most ideal conditions for learning how to windsurf! Have a look at this source Our local windsurfing spot – Poole Harbour describing in great detail what makes Poole Harbour & the surrounding area such a great place to learn to windsurf and progress on to intermediate & advanced windsurfing. To sum it up for you, Poole Harbour has predominately on-shore winds (meaning you won’t get blown out to sea! ), gently shelving, shallow water to make it easy to get back on when you fall and windsurfing lessons & windsurf hire for all levels of ability! Try it & you will wonder why you haven’t thought about it before! Formed of a Cretaceous chalk the Purbeck Hills give commanding views across Poole Harbour, the Isle of Wight and out into the English Channel. Start by taking the Poole Harbour chain ferry and then walk out past Old Harry Rocks & onto the seaside town of Swanage. On route you can see rare species of flowers, animals & birds. Soak up the sun & enjoy the golden sands of this world famous ‘Blue Flag’ beach. One of the most relaxing things to do in Dorset! Sandbanks, Poole is renowned for its perfect beach, lined by the multi-million pound houses of the rich & famous! 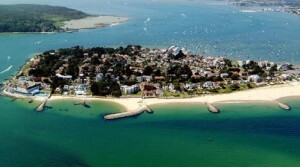 Sandbanks beach is part of the 7 mile stretch of continuous beach from the Sandbanks peninsula all the way to Hengistbury Head at Christchurch. The best place for seeing wildlife in Dorset. You can see a mass of bird life, deer & a thriving population of red squirrels. Brownsea Island is part of the National Trust organization. Taking the ferry across to Brownsea Island is an experience in itself. Once on the island there is varied landscape to explore and amazing views looking out across Poole Harbour and on to the Purbeck Hills. Kids will be happily entertained by this great Dorset activity, with the free wildlife ‘Tracker Packs’ provided by the visitor centre. Experience a unique journey through six miles of breathtaking Dorset scenery, including the ruins of Corfe Castle. Providing access to historic villages, the Jurassic Coast World Heritage Site & the seaside resort of Swanage. A great experience on your list of activities in Dorset, you can stop off at some of the local villages on-route & even take Sunday lunch or evening dining! In addition to the top 5 activities in Dorset there is a whole host of other great attractions & exploring to be done. Hire a traditional beach hut at Bournemouth or Poole, get your heart racing at the Splashdown water slide park, spend a day or evening at Poole Quay, go to the Bournemouth Oceanarium or even take to the skies in the resident Balloon based in Bournemouth gardens! The number of Dorset activities is endless.. Enjoy your stay – you certainly won’t run out of activities in Dorset!